The recent developments in Afghanistan have slowed voluntary returns from major hosting countries in the region. In total, less than 59,000 Afghan refugees have opted to return from the Islamic Republics of Iran and Pakistan in 2015. Furthermore, only some 7,500 Afghans have returned during the first half of 2016. For almost four decades, millions of Afghans have found protection, assistance and temporary solutions in the neighbouring countries thanks to the generosity of the governments and people of the Islamic Republics of Iran and Pakistan. According to current figures, Pakistan hosts some 1.5 million Afghan refugees, holding Proof of Registration Cards and the Islamic Republic of Iran hosts some 951,000 Amayesh card holders . The majority of them are second and third generation refugees living in protracted displacement and with no imminent solutions. Last year, at the request of countries in the region, UNHCR convened a High Level Segment (HLS) on the Afghan refugee situation during the 66th Session of the Executive Committee of the High Commissioner’s Programme. The objective of the segment was to draw global attention to the slow progress achieved in addressing this protracted situation and encourage support from the international community. The Solutions Strategy for Afghan Refugees to Support Voluntary Repatriation, Sustainable Reintegration and Assistance to Host Countries (SSAR), developed by the Governments of the Islamic Republics of Afghanistan, Iran and Pakistan, and UNHCR has provided the overall framework for Afghan refugees in the region since 2012. 2 Member states participating at the HLS reaffirmed the validity of the SSAR and recognized the critical role played by host countries in the region. The HLS also called for increased international solidarity and responsibility-sharing to address the protracted situation, including greater financial and political support to reinforce the resilience of refugees and host communities and to find durable solutions for Afghan refugees. The Islamic Republics of Afghanistan, Iran and Pakistan have been strong supporters of the SSAR and regularly participate in tripartite and quadripartite meetings with UNHCR to coordinate solutions for Afghan refugees. However, there are serious concerns about the limited prospects for return to Afghanistan and the decreasing support of the international community for the Afghan refugee situation. Inside Afghanistan, the situation remains precarious. The National Unity Government, formed in 2014, showed strong commitment to address issues related to displacement and placed it among its highest national priorities. This included the formation of the High Commission on Migration, chaired by the President, to address key issues relating to Afghan refugees, returnees and internally displaced people. The Government developed a national Comprehensive Voluntary Repatriation and Reintegration Strategy with UNHCR’s support and in coordination with the Governments of the Islamic Republics of Iran and Pakistan through the tripartite commission framework. Despite these positive developments, since mid-2015 the security situation in most parts of Afghanistan has been rapidly deteriorating. It has seen the highest civilian casualties recorded since 2009 (11,002 people), alongside an unprecedented number of conflict-affected IDPs today totalling 1.2 million. The country continues to face serious challenges in its nation-building and in addressing complex security issues. The situation is further exacerbated by economic challenges and slow progress in the implementation of development programmes. At the same time, the humanitarian community is severely constrained in addressing the country’s growing needs due to increasing insecurity, narrowing humanitarian space, and dwindling resources. The waning hope of many Afghans for their country’s political and economic future is driving people out of the country, many of them to the Islamic Republic of Iran and Pakistan. Many have also tried to reach Europe, hoping to find protection and opportunities for better lives for themselves and their families. Representing some 20 per cent, Afghans are ranked the second largest group of new arrivals in the Mediterranean since the beginning of 2016, roughly equivalent to that of 2015. The movement toward Europe is also reported to include Afghans who transited or resided in the Islamic Republic of Iran. 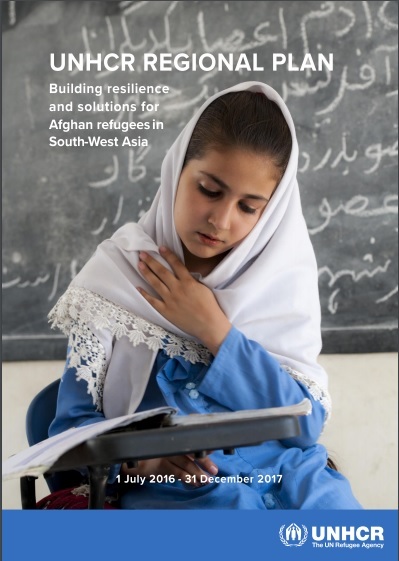 In particular, younger refugees, many of whom were born in exile, find it difficult to relate to Afghanistan and believe they will have better educational and economic prospects in European countries. Read UNHCR's Regional Plan here.